An ex-jump jockey, Ryan rode 47 winners over the sticks before spending five years with trainer Jack Berry and three years as head lad and assistant to Richard Fahey. He was granted his training licence on 15th June 1998. 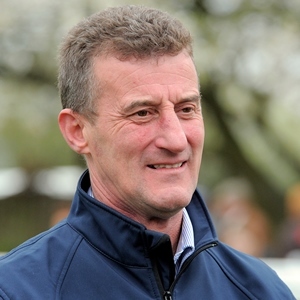 Born in Ireland, Kevin Ryan is married to Jill and their daughter, Amy, is a highly promising young jockey who enjoyed a breakthrough year in 2012 when her 40 winners saw her crowned as Britain’s Champion Apprentice Jockey. Ryan trains at Hambleton Lodge, Hambleton, near Thirsk, in the very yard once occupied by racing legend Sir Noel Murless. He has around 120 horses in training. He has won three Group 1 races – the Middle Park Stakes (with Amadeus Wolf in 2005), the Racing Post Trophy (Palace Episode 2005), and the Prix de l’Abbaye de Longchamp (Desert Lord 2006). Glory Awaits ran a fine race to finish second (to Dawn Approach) at odds of 150-1 in the 2013 QIPCO 2000 Guineas, the opening race in the QIPCO British Champions Series, though he failed to build on that afterwards. His stable star in 2013 was the two-year-old Astaire who won the Group 2 Irish Thoroughbred Marketing Gimcrack Stakes at York followed by the Group 1 vision.ae Middle Park Stakes on Dubai Future Champions Day at Newmarket. However, the runner-up in the Middle Park was also trained by Ryan, Hot Streak, and he rates him as the best horse he has trained and he delivered him his first QIPCO British Champions Series victory in 2014 in the Betfred Temple Stakes at Haydock Park, but he could only finish third behind Sole Power in the King’s Stand Stakes. The Grey Gatsby won the French Derby for him in 2014 and then ran a fine to be second to Australia in the Juddmonte International before notching another Group 1 success in the QIPCO Irish Champion Stakes, beating Australia by a neck. As a four-year-old, he was perhaps a shade unlucky not to get his head in front in the Prince Of Wales’ Stakes as he was denied by a short-head by Dermot Weld’s Free Eagle. Ryan hit the woodwork for a second time at Royal Ascot as Astaire ran with great credit to finish third behind international raiders Undrafted and Brazen Beau in the Diamond Jubilee Stakes. The Grey Gatsby continued to run honourably in the 2015 QIPCO British Champions Series. He finished runner-up in the Coral-Eclipse – finding only Investec Derby hero Golden Horn too good – and was third in the Juddmonte International Stakes.